Separated by the River Danube into Buda and Pest, the two parts of Budapest couldn’t be more different. While Pest is flat and more modern, Buda is the hilly and more historical part of the city. Buda was once the place of residence for the Hungarian Kings who chose this side of the Danube for strategic reasons. 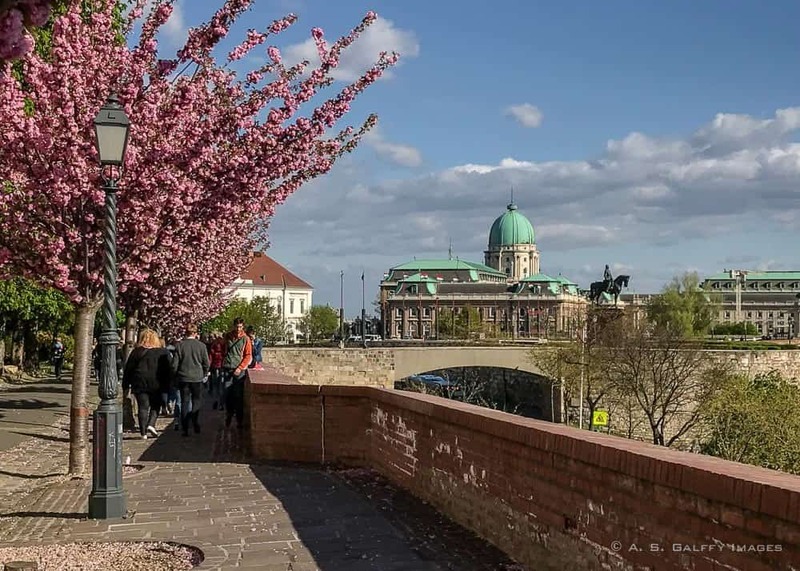 The hill on which Buda sits –Castle Hill– is home to the main Budapest Old Town attractions: the Buda Castle, the Fisherman’s Bastion, and Matthias Church. This part of Budapest is a lovely pedestrian zone, small enough to be discovered by foot. Here you’ll see houses dating back to the 14th century, walk on cobblestone streets, and dine into some of the best restaurants in Budapest. In Budapest Old Town is where you’ll get a real feel of old, medieval streets. 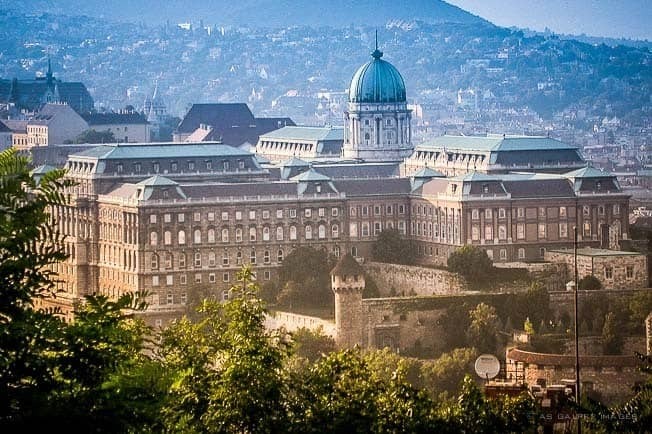 Budavári Palota (Buda Castle) is considered the most popular attraction on Castle Hill. Also called the Royal Palace, the castle was first completed in 1265 by King Bela IV. Today the castle is home to the Hungarian National Gallery, the Budapest History Museum, and the National Széchényi Library. If you don’t have time for both museums, you should at lease visit the national gallery, which displays an amazing range of artworks, from Gothic altarpieces to paintings by Hungarian realists. Every fall, one of the most famous gastronomic events in Budapest –the International Wine Festival– takes place on the castle grounds. If you are ever in town in September, make sure you check it out. To the east of the palace entrance you’ll see a bronze statue of the Turul Modár, a mythical bird resembling an eagle or a falcon. According to legend , the emblematic bird impregnated Emese, grandmother of Árpád, the military commander who led the Magyar tribes into the Carpathian Basin in about AD 895. Right beneath the Castle Hill there is an underground Labyrinth (Budavari Labirintus). The Labyrinth is located in a complex of caves and cellars that were created millions of years ago as an effect of the hot water springs. In the 15th century the caves served as a prison. The most famous prisoner of the Labyrinth was Vlad Tepes, also known as Count Dracula. Tepes was King Matthias Corvinus’s prisoner for 12 years. During World War II, the underground labyrinth served as a shelter and a military hospital. Later on, in modern times, the Budapest Labyrinth became a museum. The Fisherman’s Bastion –Halaszbastya, in Hungarian– is arguably the best known of Budapest Old Town attractions. It’s easy recognizable neo-Gothic style terrace dominates Castle Hill. The stronghold is believed to derive its name from the guild of fishermen who were responsible for defending this area in the Middle Ages. Fishermen’s Bastion was built as a viewing platform after the Siege of Budapest, since Buda Castle was no longer considered to be of military importance. The panorama terrace was built with the idea to recall the old times, thus the bastion looks rather like a fairy tale castle. 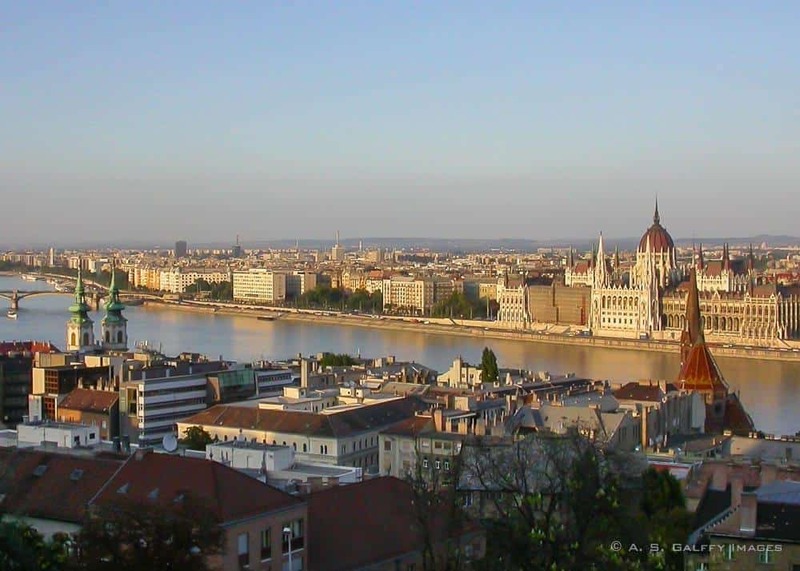 From here you have the best unobstructed views of the entire Budapest downtown, Parliament Building and Danube River. The café serves beer, sandwiches, and cakes in a very casual atmosphere. The Bastion can be visited during the day time for a small entrance fee, but if you come at night you can easily bypass the small metal gate and see the towers and terraces. 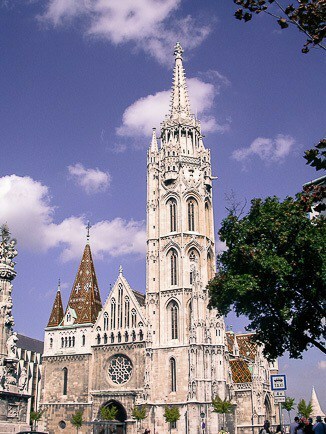 Mátyás Templom, as the local call it, is a Roman Catholic church named after the beloved king Mattias Corvinus. King Mattias is considered the promoter of Italian cultural influences in Hungary. The church is located in Trinity Square, next to the Hilton Hotel. Although the initial construction dates back to the 14th century, the church’s tiled roof and fantastic Neo-Gothic ornamentation is actually newer (19th century). Citadella is an U-shaped fortress located on the strategic Géllert Hill, also on the Buda side. The fortress was initially built as a place of surveillance by the Habsburg Monarchy after the suppression of the Hungarian Revolution of 1848, to keep the rebellious city under control. Although the fort had 60 cannons, it was never a working fortification, but rather a threat for those who might think of. After the Austro Hungarian Compromise of 1867, the Hungarians demanded the destruction of the Citadel. But it didn’t happen. In the 1960’s, after much debate, the local government decided to turn it into a tourist center. 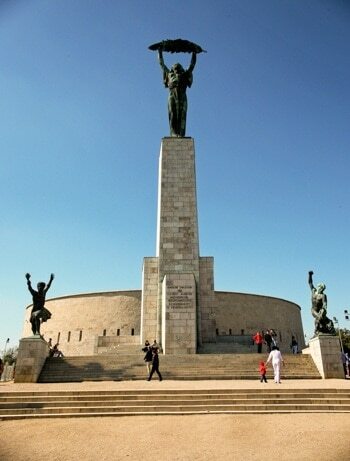 In front of the Citadel rises the Liberty Statue, a peaceful female figure holding a palm branch in her hand. 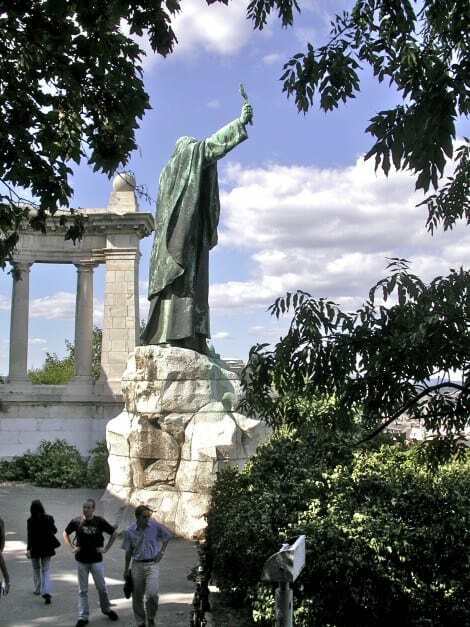 The statue was erected by the communists to celebrate Budapest’s liberation from the Nazi troops. The Citadel houses a free exhibition about the history of Budapest, as well as a World War II museum that charges a small entrance fee. Gellért Hill offers the most spectacular views of Budapest, the River Danube and its eight bridges. The place is less crowded at night, when the arts and crafts bazaar closes. From the Citadel, you can to climb down to the city following a very beautiful shaded path though the woods that cover the hill. At the foot of the hill, right before reaching the street, you’ll come across Gellért’s Monument. 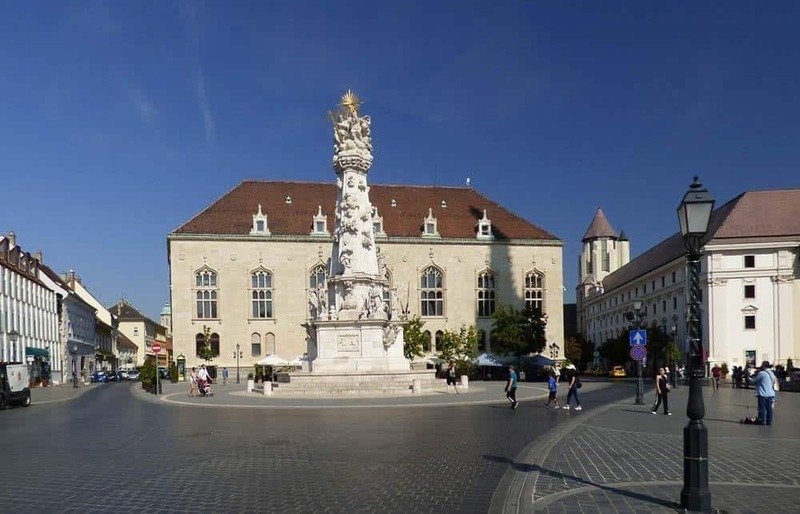 The statue represents Saint Gerard (Gellért), who was was put in a barrel and rolled down from the top of the hill for trying to convert the pagan Magyars to Christianity. The slopes of the Géllert Hill are steep and hard to walk. Especially during the hot summer days. A better option is to take the tram up to the top of the hill. Tram 47 or 49 from Deak Tér will go there. Also, bus #7 from the Keleti Station, Astoria, or Ferenciek tere. Gellért Baths was built between 1912 and 1918 on the site of a former hospital dating back to the Middle Ages. The complex is one of the most famous thermal spa baths in Europe. Both the outdoor and indoor pools contain water from Gellért Hill’s mineral hot springs. The springs are rich in calcium, magnesium, chloride, sulfate and fluoride, thus have great healing and cleansing properties. There are pools with various water temperatures, two kinds of saunas, massage, and spa treatments at reasonable prices. The building’s architecture is outstandingly beautiful and very unique. Intricate mosaic floors, stained glass windows, wooden interiors the changing rooms. Every corner is beautiful down to the finest detail. Gellért Baths are one of the most popular Budapest Old Town attractions, both for locals and visitors. An equally beautiful bath that rivals with Géllert is Szechenyi Baths, located on the Pesta side of Budapest. 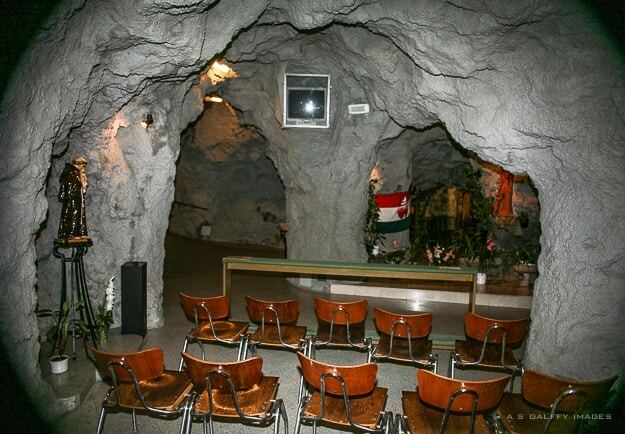 The Cave Church (Sziklatemplom) is perhaps the least known of all the Budapest Old Town attractions. This small still functioning chapel is located in the cave system of Géllert Hill. The communist regime sealed the church entrance with concrete for nearly 40 years, therefore if you visited Budapest before the 1990s chances are you haven’t heard about it. The The entrance is across the street from Géllert Baths. The church reopened in 1989, after the fall of Communism. The interior of the church is certainly interesting, but not particularly beautiful. There is an audio-guide available that I would recommend. Below is a list of some of the best activities in Budapest. My favorite one is the 1.5 hour Budapest Night Cruise. It’s a beautiful, narrated tour that takes you along the Danube river and lets you enjoy the most fascinating sights of Budapest. There is nothing like seeing the city lights from the panoramic deck while sipping a glass of Champagne! Staying in Budapest Old Town has its own advantages. This is the ideal location if you want a quieter, more relaxed setting. This side of the Danube is way less crowded and has some of the most spectacular views of the city. While many visitors to Budapest prefer the Pest side because of its proximity to shopping and restaurants, Budapest Old Town attractions and spectacular views weigh in favor of this side of town. There are many lodging options in this area, from reasonably priced apartments, to bed-and-breakfasts, hotel rooms, and hostels. To find the best deal and compare prices you should check TripAdvisor, which is also a good source if you want to read what other travelers have to say about these places. Another good option to keep in mind is VRBO – Vacation Rentals By Owner , also a great resource for affordable accommodations. Have you visited Budapest Old Town? Was was your favorite spot? Where did you stay in Buda? I'm planning a trip this Fall. We stayed in a B&B close to the Fishermen's Bastion. There are many in that area. Budapest is such a wonderful city. Your photos show many places that I didn't get to see when I was on a student tour many years ago. Next time we go back to Budapest, I want to check out the Gellert Baths. We went to the Szechenyi Bath our first time and that was amazing! Highly recommended! Gellert Baths is very different from Szechenyi: somewhat fancier and more sophisticated. I'll be in Budapest next spring - thanks for the tips! I can't wait to see them for myself! Hope you'll enjoy Budapest, Amy. The Baths are a must if you go there. So excited to be landing in Budapest in mid-May and will definitely put your suggestions to good use. We'll be heading to Slovakia then Croatia after to explore over nearly two weeks. Thanks for these recommendations. Hope you'll make it to Budapest as well, Elaine. I'm sure you will like the city. I totally agree. Margot sziget is absolutely lovely. You can spend an entire day visiting it. Hi Anda! Love your post. 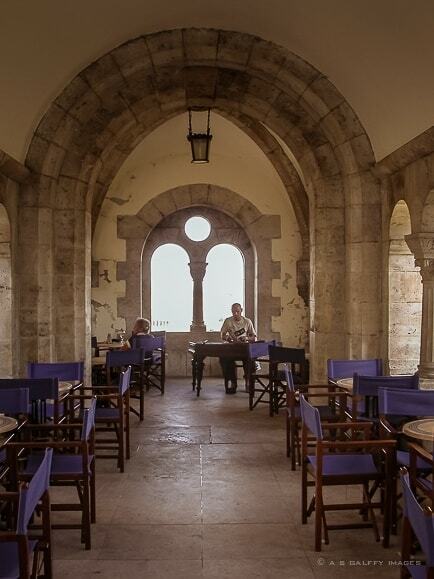 Your photos of the Fisherman's Bastion were incredible. It's too bad about the labryinth - I didn't even know about it when I was in Budapest the last time and now it's too bad I'll never be able to experience it in all its glory! Thank you, Stefan. You can go visit the Labyrinth, but only a small part of it is now open. Thank you, Samyia. Hope you'll get to visit this wonderful city someday. I'm sure you'll love it. As I was reading about the labyrinth I was bummed that I missed out on that. Then I saw your note about it being closed. No wonder! Everything else is definitely a must see. My favourite is Fisherman's Bastion I think. The Labyrinth is not entirely closed. Just the part with the mural paintings, unfortunately. You can still get an idea of how it looks, although is not as interesting anymore. I was in Budapest in April but missed the Labyrinth. Guess I need to go back- looks neat! The Labyrinth is partially closed now, Hannah. The mural paintings that I have on my post can no longer be viewed unfortunately. Thanks for sharing Anda, I loved Budapest, the Fisherman's Bastion is a great look out. I didn't get to the labyrinth cave and cellars but will be sure to check out the unique Cave Church on my next visit. You should do that, Lyn. Curious about your visit in Budapest. That's a stunning shot of Buda Castle - great job!